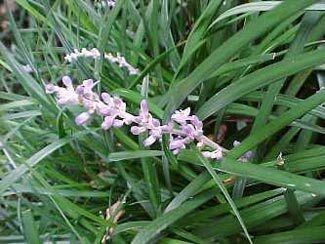 It is a ground cover that flowers from the end of April to the beginning of July and well marked by its solitary, tapering flower-stalks, 6 to 9 inches high, and its creeping scions or runners. These are long shoots, sometimes a couple of feet or more long, sent out from the rootstock. At intervals upon them are pairs of leaves, and at the same point rootlets are given off below, which enter the earth. As winter approaches, the runners die, but at every point where the leaf-pairs and the rootlets were formed, there is a dormant plant waiting to develop fully in the spring. The flowers are of a purplish blue, crowded into a spike formed of about six or more rings of whorls. 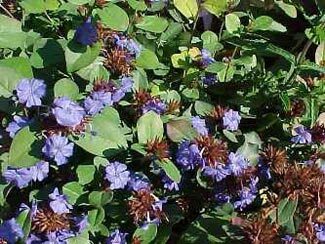 Plumbago (also commonly called leadwort) is a wiry, mat-forming perennial which spreads to form an attractive ground cover. Typically grows 6-10" tall on generally erect stems rising from the rhizomes. Oval, shiny, medium green leaves (to 2" long) turn bronze-red in autumn. 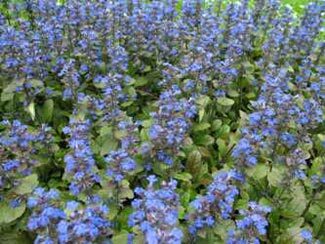 Clusters of 5-petaled, blue flowers (1/2 to 3/4" diameter) appear above the foliage over a long summer to frost bloom period. Euonymus fortunei 'Coloratus' (Purpleleaf Wintercreeper) is a dense, woody-stemmed, broadleaf evergreen plant which is grown primarily as a trailing groundcover. It features lustrous, ovate to elliptic, dark green leaves (1-2" long) which turn dark purple in fall and winter. Inconspicuous, greenish-white flowers may appear in June. 'Coloratus' is one of the most popular evergreen ground covers available today. 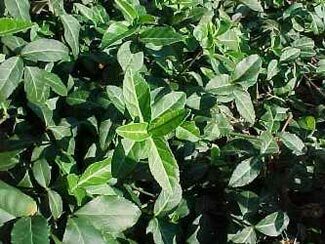 Euonymus 'Minimus' has a smaller leaf, and is slower and lower growing. Blue fescue is a low-growing, semi-evergreen, clump-forming ornamental grass noted for its finely-textured, blue-gray foliage. Foliage forms a dome-shaped, porcupine-like tuft of erect to arching, needle-like blades radiating upward and outward to a height of 6-8" (inflorescences typically bring total clump height to 10-14"). Light green flowers with a purple tinge appear in terminal panicles atop stems rising above the foliage in late spring to early summer, but inflorescences are not very showy. Flowers give way to buffy seed heads. 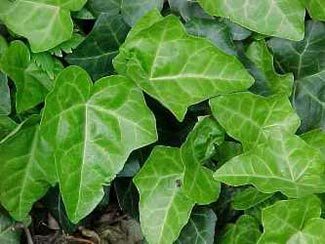 English ivy is a fast-growing, evergreen perennial that is primarily grown as a climbing vine or trailing ground cover. Leaves are a deep green with a pronounced central lobe and creamy white veins. Baltic Ivy has a small, pointed leaf, Thorndale Ivy a mid-sized leaf, and English Ivy a broad , larger leaf. All become reddish in winter. 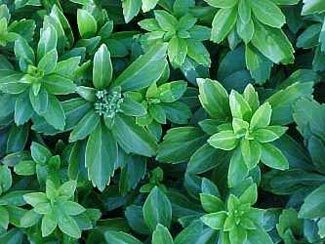 Houttuynia is a perennial ground cover that typically grows 9-15” tall and spreads indefinitely. 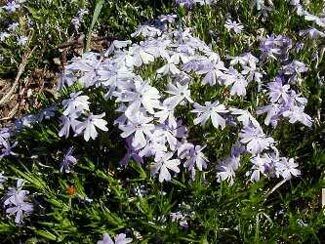 It is primarily grown as a ground cover in moist to wet areas. ‘Chameleon’ features green leaves variegated with shades of red, pink, yellow and/or cream on bright red stems. Foliage is aromatic when bruised. Tiny, inconspicuous greenish-white flowers in 1-1.5” spikes are subtended by four showy white petal-like bracts. Flowers appear in mid to late spring. St. John's Wort is a shrub, typically growing 12" high and 24" wide, which is frequently planted as a ground cover. 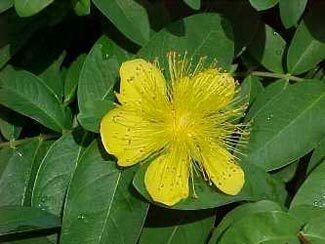 It features large, rose-like, 5-petaled, yellow flowers (2-3" diameter) having numerous, bushy stamens with reddish anthers. Flowers appear singly or in groups of 2-3 and cover the plant in summer. Oval to oblong leaves (to 4" long) are rich green in sun but are a lighter, yellowish green in shade. 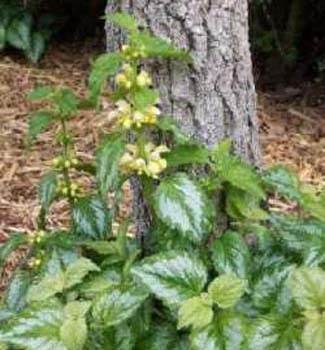 Also commonly called Yellow Archangel, this spreading perennial is most often grown as a ground cover. Typically forms a loose mat of foliage (to 12" tall) which spreads indefinitely. Ovate, medium green leaves are usually splashed with silver. Whorls of small, two-lipped, yellow flowers appear in whorls on short axillary stalks (to 3/4" long) in late spring. 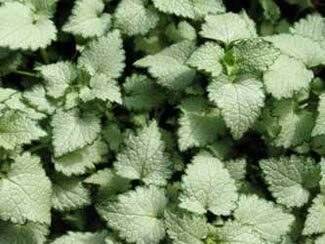 Spotted Dead Nettle is noted for its compact size, variegated foliage, white or pink flowers and spreading habit. 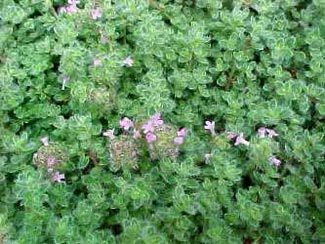 It is a mat-forming perennial ground cover that typically grows 3-6” high and spreads to 12-24” wide or more by sprawling stems which root in the ground at the nodes as they go. It grows vigorously in optimum conditions but is easy to control and is not considered to be too aggressive. 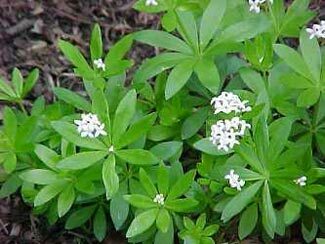 Features arrowhead-shaped, silvery white leaves with thin green margins. Clusters of small, white or light pink flowers appear at the stem ends in late spring to early summer, sometimes with a brief fall rebloom. 'Big Blue' lilyturf is a tufted, grass-like perennial which typically grows 12-18" high and features a clump of strap-like, arching, glossy, dark green leaves (1" wide). Variegated lilyturf has arching leaves of yellowish-white and green. Clumps slowly expand by short stolons, but do not spread. 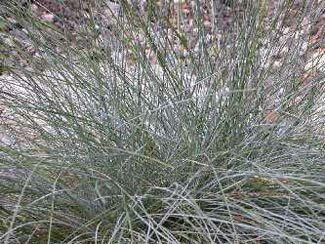 'Spicata' is a creeping lilyturf which has a spreading habit. Erect, showy flower spikes with tiered whorls of dense, lavender flowers rise just above the leaves in late summer. Flowers give way in fall to blackish berries which often persist into winter. Evergreen in the South, but foliage can turn brown in areas with cold winters such as Ohio. Japanese pachysandra is a shrubby, evergreen ground cover which grows 8-12" high and spreads by rhizomes to form a dense carpet of rich, dark green foliage. Oval leaves (2-4" long) appear primarily in whorls at the stem ends. Tiny white flowers in 1-2" long spikes bloom in early spring. 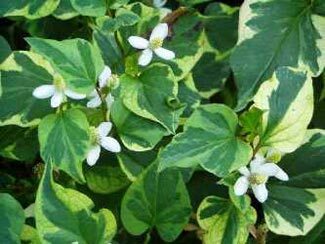 'Green Carpet' pachysandra typically remains lower than terminalis, while Variegated pachysandra has green and white foliage. Phlox subulata (also moss pink, mountain phlox or creeping phlox) is a vigorous, spreading, mat-forming, sun-loving phlox that grows to only 6” tall but spreads to 24” wide. It is noted for it creeping habit, its linear to awl-shaped leaves (which retain some green in winter) and its carpet of mid-spring flowers with notched flower petals. It is native to somewhat dry, rocky or sandy places, open woodland areas and slopes from Michigan and Ohio south to Kentucky and Tennessee. 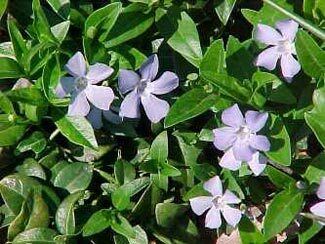 Loose clusters of fragrant, tubular flowers (to 3/4” wide) bloom in April-May. Each flower has five, flat, petal-like, rounded lobes that are distinctively notched. Flowers are violet-blue, pink or white. 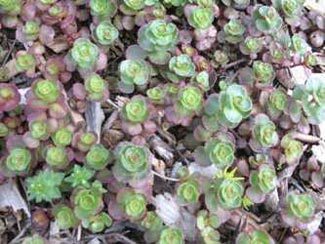 Sedum is a low-growing, sprawling, mat-forming ground cover (also commonly called Stonecrop). It typically rises only 2-6” tall but spreads to 12-18” wide. Creeping, branching stems root at the nodes. Leaves are attractive throughout the growing season. Varieties are available with many flowers colors. 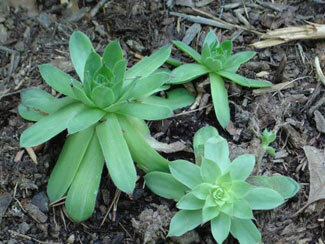 Hens and chicks comprise a group of succulent plants that make interesting rock garden specimens. Rosettes are of various colors and sizes. The flowering stem from a rosette will die and is replaced by offsets (called chicks) that it has produced. 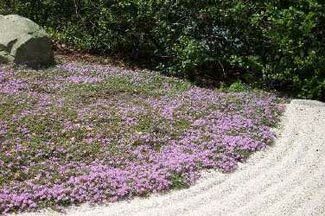 This thyme (sometimes commonly called creeping thyme, wild thyme or mother-of-thyme) is a creeping, woody based perennial which is primarily used as a ground cover. Numerous, thin, somewhat woody stems form a flat mat (2-3" tall) with tiny rounded, glossy blue-green leaves (to 1/4"). Although leaves are aromatic, strength of scent varies according to season and habitat and leaves are usually not considered to be of culinary quality. Clusters of tiny, tubular, deep pink flowers appear in summer. Flowers are attractive to bees.